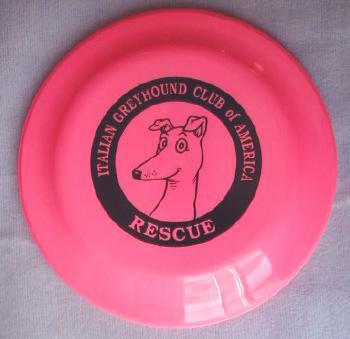 Frisbees with an IGCA Rescue Iggy in the middle are now available. Each frisbee measures 9" diameter. These little hummers go zinging through the air like you wouldn't believe. Your dogs, kids and husbands will LOVE them!!!!!!!! They are available in all sorts of colors: hot pink, aqua, white, green, purple, red & orange. Price is $6.00 apiece or 2 for $10.00. Shipping is included! Please click on first PayPal button to order one IG Frisbee. Click on second PayPal button to order additional IG Frisbees.